Ronald Graef was at his wit’s end. After creating two or three separate accounts, completing five applications and spending hours on the phone with customer service to enroll in a much-needed health insurance plan on Healthcare.gov, the website for the Affordable Care Act, he knew he needed help. Graef finally decided to attend an enrollment event at the Gerald L. Ignace Indian Health Center, 1711 S. 11th St., where an application counselor put him on the right track within about an hour. Time well spent, said Graef, who expects to save about $500 each month in his health insurance premium, based on the plan he signed up for on the Healthcare.gov marketplace. The healthy bachelor, who lives frugally (he has no cable television), plans to save most of the extra money for retirement and any unforeseen repairs to his car. “That’s the only reason I kept pursuing it,” Graef said. Graef also beat the March 31 deadline, when the ACA open-enrollment period ends. Individuals who remain uninsured after the March 31 deadline face a tax of 1 percent of their annual income or $95, whichever is greater. 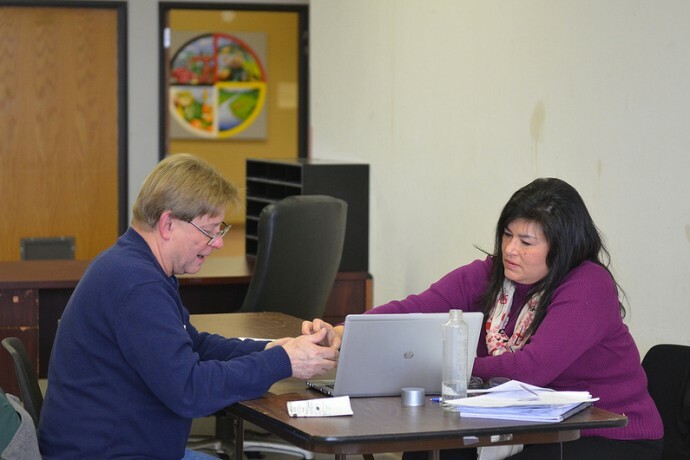 As the deadline looms, officials at the Milwaukee Enrollment Network, a consortium of more than 100 organizations, are pushing to get thousands of uninsured Milwaukeeans informed about the tax implications and insurance options they may have. The consortium is working blindly because enrollment data is not available until weeks after the fact, according to Reardon. “I think we will have a really good feel by this summer on how this has all shaken out,” Reardon said. 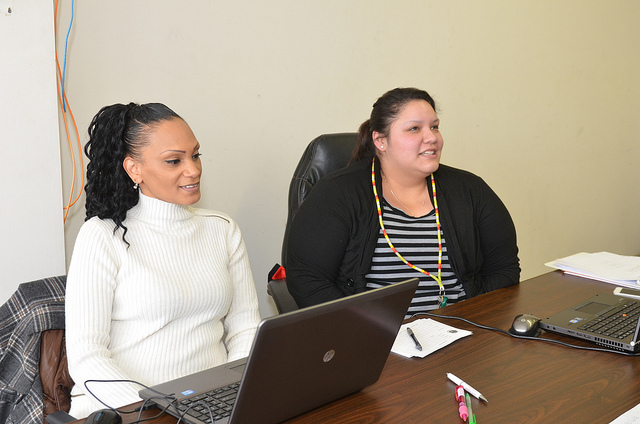 The time between creating an account on the website to getting insurance cards in the mail can vary greatly, causing frustration and anxiety for enrollees, said Shendola Duke, an application counselor at the Ignace Indian Health Center. Months ago, most individuals Duke helped had a sense of urgency. Now, many are procrastinators, she said. “Now they are panicking,” said Selena Roberts, one of Duke’s colleagues as the two waited for more individuals to trickle into the event. The identity verification process involving a credit agency can lead to frustration for some individuals, especially for those who have never had credit, according to Roberts. “I have to tell them that it’s to protect them, to make sure that someone else is not saying they are them,” Roberts said. In a broad sense, according to Roberts and Duke, much of the uncertainty individuals have with the enrollment process is derived from distrust in government. For example, counselors get a lot of pushback when they ask for middle names or email addresses. “It sounds like Big Brother” is a refrain Roberts and Duke hear on a regular basis. Premiums also remain a major obstacle for many individuals enrolling in an insurance plan through the ACA, according to Black Coalition of Wisconsin spokeswoman Clarene Mitchell. “Even once they go and complete their enrollment and they get a plan, and even if they get a reasonable premium amount, it’s still an adjustment to make those payments,” she said. According to Mitchell, the flow of traffic into the organization’s office and at its ACA events has remained constant. The one difference over time has been that individuals are much more prepared with necessary paperwork than they were a few months ago, Mitchell said. At the Milwaukee Health Department, 13 certified application counselors have helped more than 1,000 individuals initiate their application on Healthcare.gov while the city has fielded more than 500 phone calls regarding the ACA, according to Sarah DeRoo, spokesperson for the agency. City application counselors also have spent a lot of time directing individuals to BadgerCare, the state’s Medicaid program, DeRoo said. Changes to BadgerCare also kick in for adults on April 1, when income eligibility decreases from 200 to 100 percent of the federal poverty level for adults with children. Also beginning April 1, childless adults who make less than 100 percent of the federal poverty level are eligible for BadgerCare benefits.